Every now and then, I will offer some of my original work free for download -images, printables, desktop/smartphone wallpapers, etc. I'm still learning as I go in this graphic design/lettering world, but practice makes progress. And practice will inevitably lead to a lot of completed work that will just sit and collect digital dust unless I share them with others. Although the pieces/designs may not be perfect, I hope they will still encourage and inspire. I've learned that some things don't have to be perfect to be shared. Done is better than perfect. To download, tap on image or FREE DOWNLOAD link below. Download/Save image to your phone and set as wallpaper and/or screenlock. For personal use only. Hand lettering by lillianliming. For the last year, I've been trying to make this quote my motto (re: blogging) but somehow I keep getting stuck. Whether it's the blog layout or the photo edits, I get overwhelmed with the idea that each aspect should be perfect - that it should look like this blogger who has properly lit, crystal clear photos or that blogger who has such a pretty & professional blog design. Ugh. Why do we put ourselves through that? I need this constant reminder for myself - that's why I created this wallpaper/screenlock. And the irony is that while lettering and editing it, I started noticing minuscule flaws and allowing doubts creep into my brain. So what if there are hundreds of other similar designs out there? NO ONE has my handwriting/lettering style! So what if I don't use professional/paid programs such as Photoshop, Illustrator or whatever you're supposed to use? I make do with the free ones out there, and you know what? The images I create are not too shabby for someone without any formal training in graphic design or the visual arts. Hopefully, this freebie will be helpful to at least one other person out there. Please give me a shout in the comments if you decide to use it - and do let me know if I can make any improvements as far as dimensions and alignment goes. I would love your feedback. Thanks! PS. Eventually, I would like to post a tutorial or write-up of how I create my images but for now, my go-to (FREE) online programs are PicMonkey, LunaPic, and Canva. What design tools do you use for creating graphics? Every now and then, I will offer some of my original work free for download -images, printables, desktop/smartphone wallpapers, etc. I'm still learning as I go in this graphic design/lettering world, but my motto is that practice makes progress. And practice will inevitably lead to a lot of completed work that will just sit and collect digital dust unless I share them with others. Although the pieces/designs may not be perfect, I hope they will still encourage and inspire. I've learned that some things don't have to be perfect to be shared. Done is better than perfect. To download, click on image or FREE DOWNLOAD link below to open original image. Right-click to save image to your computer. For personal use only. Photo and hand lettering by lillianliming. Photo taken in Taichung, Taiwan. Proverbs 31 has always been one of my favorite passages. Even as I have wavered in my faith the past few years, the epilogue describing the wife of noble character is something I'm constantly striving towards as a woman of God, and as a wife. Obviously some of the examples are a bit outdated, but there is still a lot of practical wisdom and encouragement that can be taken away from the passage. A few years ago after I lost my job, I had started a personal blog with the intention of using it to encourage other women and used this verse as my "tag line". 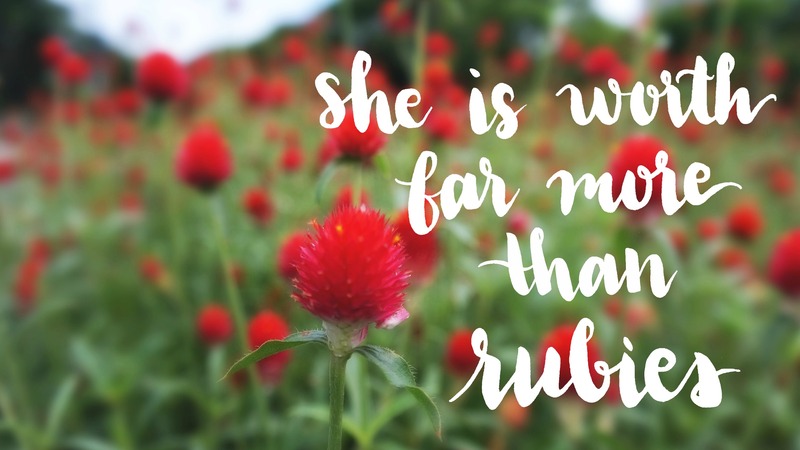 I wanted to remind my girlfriends and sisters in Christ that we are worth far more than rubies. We have so much to offer, even though many times we don't believe it of ourselves. At that time, however, I did not believe it of myself -- I felt the complete opposite. If I had to be honest with myself, I was the one that needed this constant reminder of worth. Needless to say, the blog was quickly abandoned. Today, it's with God's grace that I have a renewed faith and hope for the future - that I have so much to offer but the only eyes that I need to impress are those up above.